This post is about people who claim that they cannot lose any weight. I have been on the BB and MFP boards for a while now and it seems that there are those who lose weight consistently (assuming that’s their goal) and those who don’t. Now, those who keep losing weight get excited and stay motivated because they see results. Remember, and I said this before, your “why” and your results will keep you motivated. A nice coach helps too! The more time I spend on the boards, the more I see people posting these types of comments. Before I committed myself to my nutrition and my workouts, I used tell myself that working that hard was probably very discouraging. After all, who wants to spend an hour to an hour and a half working out to end up looking the same week after week? Wouldn’t you feel discouraged? I would. Especially after putting all the effort I put into my nutrition and my workouts. And honestly, I wouldn’t blame them. The real problem with this is that these are the same people who DO give up and stop before reaching their goals. I suspect that some of them are also the same ones that come back to the boards to trash a particular program because it “doesn’t work.” This even got me worried when I first started because I didn’t want to spend money on a program just to look the same after 90 days. I can do that by sitting on the couch watching TV all day. After reading all these different posts for a while I realized that they are all saying pretty much the same thing. And the truth always comes out, ALWAYS. Sometimes I jump in and ask people questions and after an answer or two, the truth emerges. It’s not their workouts. After all, there are plenty of success stories out there. My initial guess had always been that the problem was not the programs. So then what is it? It’s their NUTRITION. They are just not eating right and somehow they have managed to believe that they are. I know it’s hard for some people to understand the nutrition guide. However, in my opinion, if you need to lose fat and you follow the nutrition guide; you will see that fat melt. And it doesn’t matter if you’re young or old, or if you’re male or female. Anyone who follows the guidelines with some caloric adjustments will see the fat disappear. Of course, the exception to this would be for those who have a medical condition or illness. So why are so many people not losing weight if they are following the guide? It’s simple. They are not. People aren’t following the nutrition guidelines, yet they are claiming that they’re “eating healthy”. This is where the real problem is. Often times I am asked to look at someone’s diary and that tells me part of the truth. They are NOT following the diet! They are eating things they shouldn’t. They aren’t getting the right percentages. They aren’t timing the meals properly. In essence, they are not doing what they are supposed to be doing. They are lying to themselves. One frequent problem is that their meals are very high in carbs and low in protein. I ask them to increase their protein to maximize their weight loss. And what response do I get? “I can’t eat that much protein”. If the problem is their timing, they will say that it’s too hard to eat every 3 hours. Another problem is that people underestimate the damage that things like dressings and oils in food preparation can do to their nutrition. They won’t enter it into their diaries but believe me, it counts. The evidence for poor nutrition goes on and on. It is very discouraging to read these comments. Mostly because I can only help you find the way, but you have to walk it. Lying to yourself is not the way to succeed in these programs. I remember when my fiancée joined me and started tracking her nutrition. I helped her to figure out her percentages and calories. With the help of nutritional drinks, she has consistently lost weight week after week. My fiancée doesn’t work out every single day with me and yet she’s losing more weight than those who do. So what’s the difference? It’s her NUTRITION. She has basically followed the nutrition guidelines that I follow. If I eat chicken, guess what she’s eating? Nope, I don’t cook twice. If she wants to cook for me, she asks me what I want. Guess what she’s cooking – what we need. In essence, we are eating the same thing most of the times. She’s seen big changes and that’s where 80% of your results come from- your nutrition. She’s 4’11” and significantly smaller than me, yet the same principles work. I am a living proof that the guidelines work. They worked amazingly for me because I committed myself to my nutrition. I followed the recommended percentages every single day until I got within 2% of my body fat. I found an excellent FREE app that helped me track my nutrition – My Fitness Pal. We used to have to write down what we ate if we wanted to keep track, but now technology is giving us a hand, USE IT! 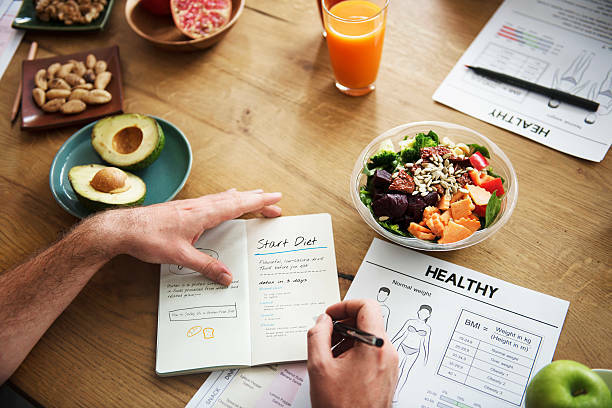 Plan ahead and commit to tracking your nutrition. If you stick with it, it will WORK! So please start tracking your nutrition. It may be annoying at first but your results will far outweigh the inconvenience. Make sure every bit goes in there. Yes, even that sip you took from your son’s milkshake! Yes, even those 2 fries you took from your daughter’s value meal! Yes, even the 3 packets of Raw Sugar and 2 teaspoons of Coffeemate you put into your coffee this morning! I use myfitnesspal. The beauty of this app is that it can tell you exactly what you ate on any day, with calorie breakdowns of protein, carbs, and fat. I did it and continue to do it because I am serious about getting results. If you are serious about your goals, DO THIS! Otherwise, don’t make excuses for why you aren’t seeing the results you want! And if you don’t have an iPhone or Droid, you can log in by going to their website. I know that this post is not going to be very popular but I want to help you achieve results. I won’t sugar coat anything to make you feel better and justify bad eating habits. If you are struggling in this area, make sure you do your part. Kim, I think where a lot of people go wrong too is when they drink their calories and when they don’t look at the way they are eating as permanent lifestyle changes for their health but as a temporary diet. Temporary diets don’t work; 97 percent of dieters regain everything they lost and then some within three years.